Odd title I’m sure, but I’m going somewhere with it. I’ve entered many contests. Some I had low expectation of winning because the odds seemed too high, only to win first place– and some I fully expected to win, only to lose, ironically, lol. Regardless of who wins or loses in a contest, I firmly believe that anyone who works hard, deserves a chance to shine, even if that person isn’t me. The true reward, as I’ve always seen it, has been the lessons learned by taking the challenge, and giving it my all, and the exposure that comes with it, no matter where I place. It’s this type of mentality, that I believe encourages healthy winning, and healthy losing– because you can celebrate, no matter if things ended in your favor or someone elses. But what does that have to do with the sketch cards I’ll be sharing over the next couple of weeks? Well, some of my best clients, came through the contests I’ve entered– including the ones I lost, specifically the ones from Deviantart. Deviantart, is a great resource for artists, especially the contests that they host themselves. Not only are they challenging, and typically have good judges– but the rewards are some of the best that I’ve seen, AND, the greatest part about it is that they’re public! That means you can see every entry as soon as it’s entered– ALL of them, however many thousands there may be. The ones with the highest views and favorites, populate at the top of the feed, which works well for anyone who enters because you have constant exposure, throughout the duration of the contest. If you just so happen to become a finalist– you get even more exposure, and if you become a winner– consider the flood of people visiting your page to be part of the reward, because you’re going to be featured not just with the list of winners, but often times, on different parts of the website itself. Now it’s not hard to imagine, that with all that exposure, regardless of if you win, there may still be a handful of people, or more, who decide they’d like to work with you. Steven L Frank, the commissioner of the sketch cards, just so happened to be one of those people. Before I go into the sketch card of the day, I’d like to share a few of my entries from Deviantart contests, that helped me get discovered. Steven noticed my work, when I was listed as the winner of the Fantasy Earth Zero contest. Though I hadn’t had prior experience doing comic covers– he liked my work, and very kindly gave me a shot. In order, this is a collection of all the covers, and sketch cards I’ve done, for Steven, prior to the current set. I do intent to briefly go into more detail about these covers, and the learning process I went through, but it’s time to share the sketch card of the day! Bear in mind that sketch cards are small– roughly just a bit bigger than business cards– so the quality isn’t as sharp, considering all the cards were hand painted . Sela was one of the more difficult cards to do as well. For some reason, when I got to her, the markers I was using were partially dried out, and others had bled. That’s the sucky thing about traditional art though– sometimes it can be so unforgiving and you just have to roll with what you have or start over, annnd I wasn’t starting over lol! As we go forward, into the next Monday Morning Post, I’ll be featuring the third Sketch Card in the lineup, and going into detail about some of the covers I did for Steven, and the struggles, strides, and lessons I learned in the process. So, Stay tuned! thank you for reading, I hope you liked this post, and as always, till next time, Enjoy ! Now, I’m not that old, but I remember the early days of the internet, when you had to use dial up. There was no google, no major search engines– no blogs. But for what it did have, it opened my eyes to a world of wonder and information, beyond anything I had known before. I love Turner’s art– his composition, choice of colors–everything! We had no comic stores near us, and google maps was non-existent, as far as I knew, but somehow my mom managed to find a comic store almost a 30 minute drive away from home, and after my first visit, I was hooked! I collected anything that had Turner’s name on it, but my fascination did not end there. I had to find out how they did it– specifically, how comics were colored, so I could do it too. That’s when I discovered Photoshop! Early middle school, I’d say, I began using Photoshop to experiment with digital art. At that time, it was not a very common art form. In fact, I was nearly disqualified in some of the art contests I entered, because I was the only one using the medium, and the judges couldn’t decide if it could be considered”real” art, if there was no hard original. Far cry from today, where digital art is practically a staple in the art community, lol. I came to rely on digital art a lot. Considering art stores were few and far between, and supplies were expensive, being able to explore different styles digitally worked well for me, and helped me to make my first steps into the world of comic book art. That brings us to the Illustration of the day! Steven L Frank, purveyor of premium sketch cards, as well as comic books, art books, and gig posters, who also works with Zenescope, is one of the first people to really give me a shot as an artist in comics- bringing me one step closer to an age old dream of mine, to be like the late, great, Michael Turner. Because I want to keep things short and sweet with these posts, next Monday, Ill not only be sharing another sketch card from the collection, and but I’ll also go into how Steve and I met, and some of the moves I made, which benefited me in the long run. Anyway, thank you for reading– I hope you liked this post, and as always, till next time, Enjoy ! I’ve spent quite a bit of time restructuring the overall illustration for 321 Comic’s Panorama to remove a ton of the dead space that was in it, and give it a more cosy feel, while finding a color pallet that works well with it. Aka, LOOOOT of work lol. Quite a bit of it is still too messy to show— however here is a sample from a section of it that’s looking pretty good. There is this thing I call “reaching my threshold point” where I’ll pretty much struggle through my ideas, trying different things hoping I’ll land on something that works. This applies to building a composition, and finding the right color scheme to work with. This process is often long and takes a lot out of me, but once I get to a place where I feel all my ideas have come together, and I’m comfortable enough to run with it, I’ve reached my threshold and it’s easy street from then on. After fiddling with this image constantly, I’m finally at that place and I’m hoping to finish it completely in the next day or two. We shall see lol. I’ll be honest, I’m not the neatest person in the world. As much as I try to stay organized, things always get a bit chaotic, eventually. To my friends who know me, yeah my room gets junky sometimes but I knows where everything is!! The same can be said for the many, many, art folders I have stored all over my computer. Like, I accumulate more stuff on my computer than I know what to do with sometimes, and it gets to a point where I have to spend a day trying to sort everything out to bring order back to my humble workspace. While this is annoying to me, even though I have no one to blame but myself, it’s always interesting when I dig up art that I’ve done and completely forgot about–especially when some of it has never really seen the light of day. This post is dedicated to some of those. And there’s one thing that all of these have in common. FAN ART! Now in addition to my first confession in this post, I’m also the sort of person who likes to hide my “failures” For example, if I’m cooking dinner, and I burn it– You’ll never know, because it’ll be in the trash before you suspect anything, and I’ll be asking for dinner out! Same goes with my art. Artists are truly their own worst critics– me especially. If something doesn’t come out the way I want it too, even if I’ve put in a ton of hours on it, it often joins it’s predecessors in the graveyard called the trash box. Because of this, I’ve spent years not showing any work at all, even though I’ve been drawing, simply because I’m unsatisfied with it. This is not a habit I want to keep, so when I started this blog, I accepted the fact that I’ve got a lot of growing, and a lot of learning to do, and committed to the idea of sharing the good, the bad, and the ugly. 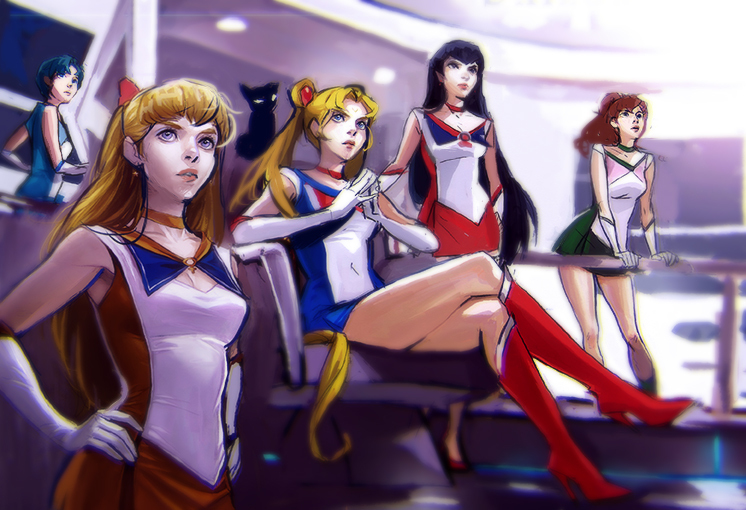 With that said, lets start with the first drawing, where Sailor Moon meets Star Trek! I love love love looooove Sailor Moon- Sailor Jupiter being my favorite! and I love love looooove Star Trek. For some reason, I decided to try and combine the two? This was a sketch on it’s way to a full illustration but unfortunately never made it beyond that due to some issues I had with anatomy. It’s been about two years since I started this and I doubt I’ll have the time to ever bring this idea into full fruition, but I really had a lot of fun trying to imagine the sailor scouts in a different way. Onto our next entry– Post Apocalyptic Scooby Doo! 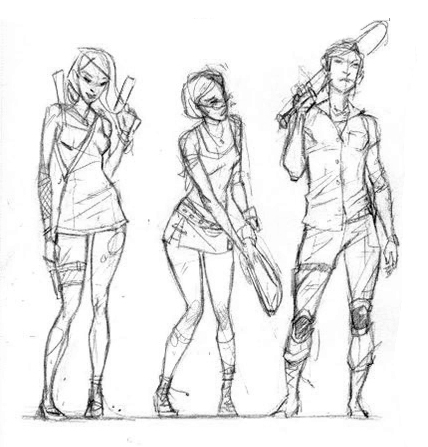 I don’t think I mentioned it before, but I’m a huge fan of things post apocalyptic, especially Zambies….and yes, I am a Walking Dead fan o.o This sketch had nothing to do with Zambies, but I wanted to draw grittier versions of the Scooby crew. This actually came straight from my little sketch book. From right to left, it’s Daphne, Velma, and Fred….I ran out of space when it came to Shaggy and Scooby, and just never got around to it again. This one, however, I do plan on bringing to life some day, with the Shaggs and Scoobs included! For the last entry in this post, a series of hand painted sketch cards, I did of characters from the Lady Death comic book. These were commissioned by Moonstone Comics, and the first one, made it as a premium card, which only 3 were selected amongst the artists that participated. These were quite difficult to do– considering there was no room for error. I had six cards to paint, and… all I was given was six cards >_<, which was a scary thought considering I rarely work in traditional mediums. But with much planning, all the cards turned out great, with a mix of acrylic, color pencils and marker. That’s all the art I have for today! But, good news. The portfolio link you see up top? It will be updated soon, with a real portfolio, which I have been designing as a book, featuring all my newest arts! All prep work for the San Diego Comicon. Also, stay tuned as I’ll be posting new arts later in the week, before the next Monday Post. Commisions321-FastComics, Anime, art, Comics, pinup2 Comments on 321- Pinup Released! I feel so old saying this, but I remember when the internet wasn’t a thing– at least not in my house! But when we got it– oh boy! I was already a fan of Japanese animation because I grew up watching Toonami which featured shows like Dragon Ball, Speed Racer… Sailormoon- TO WHICH I’M A HUGE FAN!– Sailor Jupiter foreva!!! *Clears Throat* So when we got the internet, those were the things I looked up. Naturally these searches introduced me to other anime like NGE, Tenchi Muyo– and also, Comics. I was fascinated by the photos of comic covers I would find, and in my search I discovered artists J Scott Campbell, and the late great Michael Turner of Fathom Comics. These two artists are the reasons I wanted to become one, and I begged mom to find me a comic store where I could purchase every title with their names on it just to have their art at my finger tips. I studied Michael Turner’s work in particular, even learned how to draw like him at one point because I was soooo sure that if I became good enough, I’d get to meet him one day, and maybe even work at his side. Mind you I had no idea how comics worked, so that was my idea of things. I was heartbroken when he passed, but the dream was alive in me, and I was determined to figure out how to become an artist like him. The thing is, back then, it wasn’t easy to find tutorials or how toos on the net, so I developed a skill that allows me to pick art apart, by looking at it closely. This is how I learned how to draw, up until college. Now we live in a day and age where many artist have how toos and tutorials, providing intimate details on the process they follow. What I’m doing here is much the same, only it’s going to be less about how to draw, but more about fleshing out an idea finding the right inspirations, and applying tips and tricks and problem solving. Overall, I’ll be siting sources, dropping names and links to the people and things that help me through the creative process and I hope what I have to share is helpful! With that said, lets get into the making of 321-Pinup, a Study of Rockwell. Normally I would have taken a more dynamic approach with pinup, but since I was doing it in Rockwell’s style, and I had limited time, I made a conscious decision to keep this one simple. Fortunately for me, Rockwell has a relatively simple painting style. His compositions are usually straight forward and dead centered, his figures are a bit exaggerated and gestural, which breathes more life into them, and aside from the figures in his paintings, the backgrounds or surroundings have very limited shading– as if the flash from a camera washed out most the shadows and details. One thing I had to pay attention to, when learning from Rockwell, is his Edge control– which is his ability to manipulate edges to create sharp contrasts between his figures and their backgrounds. Speaking of Edge control, it is an important tool an artist can use to create form, atmosphere and believability. In Rockwell’s work, you’ll mostly find his figures against a white background. Usually the strongest colors have the harder edges– and the brighter colors, like whites, creams, and grays have the softer edges– so soft in fact they almost blend into the white background. Putting this into practice actually helped me understand how to control my edges better making my work look cleaner. Definitely something I’ll continue to practice going forward. How you display emotion in your work can be the difference between a nice drawing, and a nice drawing with soul. Faces, particularly the eyes are the most important feature, in my opinion, because of their ability to say so much. I’ve studied a many artists- SakimiChan, Kronprinz, Nebezial— all of which have one thing in common– they can draw some dang good faces full of personality. Body language is the second most important tell of emotion. 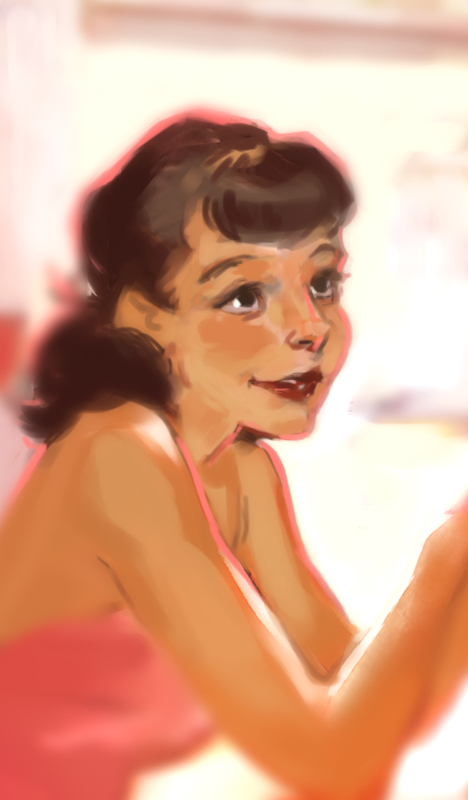 When I was painting 321-Pinup, the leading lady went through at least 3 changes in her face and body. At first she was stiff, upright and smug, not a very welcoming character to meet coming into a diner. The second one was a bit more loose in her body language, but her face wasn’t quite right. Her stare seemed blank and void of emotion. Overall she was still pretty stiff. Third time’s a charm I guess. She loosened up more, leaning on the counter, and finally I could look at her face and hear her saying “Hey there!” Comparing the 1st draft to the final product, I’m glad I put in the extra work to give these characters some feels! After toiling away for almost a day on the lady’s face, I had learned so much that the guy’s face was a breeze. YAY! progress!! I could have gone with a cleaner approach– smoothed everything out to make it look polished, but I deliberately left a sketchiness to it. I call it, showing strokes. In a way I think it adds to the personality of a painting, when you can see where the brush leaves its mark. A tip I learned from Cliff Neilson in one of his workshops, is to try to avoid using the eraser tool, in your digital paintings. Instead, treat it like real paint. If you make a mistake, paint over it, instead of erasing it. The residue it leaves after only adds to it.